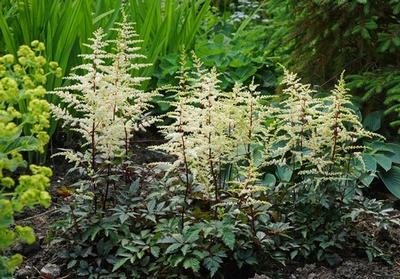 'Cappuccino' Hybrid Astilbe produces dark bronze lustrous foliage in early spring, topped by airy white flower spikes in May and June. 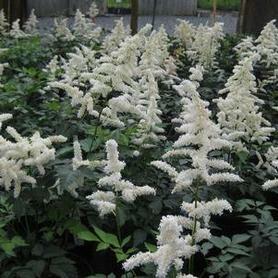 The combination is remarkable, and would be showy in mixed spring containers. 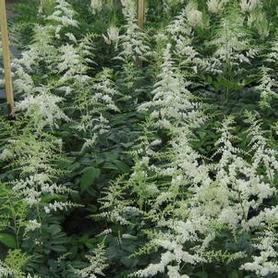 After the flowers have faded, the leaves take on green hues for the rest of the summer. 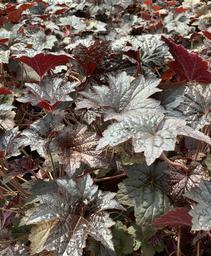 This exciting new color breakthrough would be an excellent addition to shade gardens.